Free estimates. Submit now and get fast responses from siding contractors in your area. The following cost information is intended to be general information. If you are looking for an exact cost for installing siding, please contact a professional in your local area. Local siding contractors. Siding contractors can install, replace, and repair several different types of siding. Siding can be installed on both residential and commercial buildings. No matter the size of your project, we can find a local pro to give you a cost estimate. Find a siding contractor in your area. Types of siding. Siding contractors work with several different products, including 1) vinyl siding, 2) stucco siding, 3) fiber-cement siding, 4) wood siding, 5) aluminum siding, 6) steel siding, and 7) brick and stone siding. Get matched to a local siding pro. Siding installers. Siding professionals can 1) replace your existing siding, 2) install siding for a home addition, or 3) completely cover a brand new building. When installing new siding, you may also consider installing additional insulation or a house wrap. Your contractor can help you decide the best option for your home’s exterior cladding. Free siding installation cost estimates. Siding repairs. A siding repair contractor can complete a number of different projects. They can replace metal siding that has been damaged by hail or they can repair stucco that has been damaged by water. No matter the size of the project, we can find a professional in our network to help you out. Receive free quotes from repair contractors. How much does siding cost? The cost of siding installation depends on a number of factors, including your geographic location and the material you choose. For instance, vinyl siding typically costs much less than fiber-cement siding. Most contractors will charge a fixed fee per square (about 100 square feet). If your house has more than two stories or your home has unique architectural features, this may add to the cost of installation. If you are interested in finding out exactly how much your project will cost, we suggest that you get a free quote from one of the professionals in our network. Receive free cost estimates from local siding contractors. Find a good siding contractor. It is not easy to find a good, qualified professional. Maybe we can help. Complete a request form with information about your project. We will help match your request with a professional in our network. You will receive a price estimate without cost. Our service is time efficient and you have no obligation to hire the professional we match you to. Get matched to a professional near you. Our site will save you the hassle of looking in the phone book, calling someone, waiting for a call, and then scheduling an appointment. With our service, you submit your request outlining your project details. Businesses that are interested in completing your project request contact you and provide you a quote. The companies that have the time and interest will contact you. Receive free price quotes from siding contractors. Vinyl Siding. Our contractors install or completely replace vinyl or plastic siding using a variety of colors and sizes. They can also repair or replace vinyl siding and match your existing colors & sizes. Brick or Stone Siding. Our contractors install or completely replace brick or stone siding or veneers often used as realistic alternatives to natural stone or brick. They can also repair or partially replace damaged bricks, stones or mortar. Metal Siding: Our contractors install or completely replace steel, aluminum, and vinyl coated siding. They also repair or partially replace steel, aluminum, and vinyl coated siding. Exterior Trim: Our contractors install or replace fascia, soffits, and trim around doors and windows. They can repair wood, aluminum, vinyl and steel trim. Synthetic Stucco Siding: Our contractors can install, repair, or completely replace plastic based material sprayed over foam panels. Traditional Stucco Siding: Our contractors can install, repair, or completely replace traditional stuccos. Wood Siding: Our contractors can install or completely replace wood siding. For repairs, see our carpentry category. 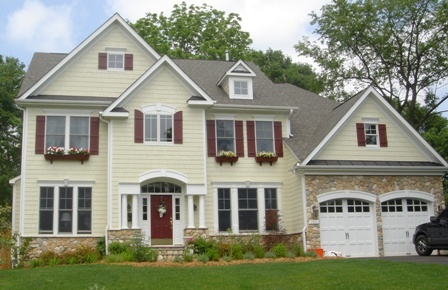 Fiber-Cement Siding: Our contractors can install or completely replace fiber cement siding. Log Siding & Vinyl Log Siding: We will help you locate a contractor that installs or repairs log siding.